Inner Circle condos for sale are located just slightly southeast of the center of the Columbine loop right next to the Four Seasons pool. To reach the base of Peak 9 of the Breckenridge Ski Resort is a quick hike in summer or a short skate in the winter. The start of downtown Breckenridge is just a block away, outside the loop. All the condominiums on the Columbine Loop share use of the Columbine, or Four Seasons pool and clubhouse, which has an outdoor heated pool and several hot tubs. The free town shuttle stops on Columbine and makes everything in Breckenridge easily accessible from any condo for sale in Inner Circle. Explore the available Inner Circle condominium listings found below, or find out more about the nearby amenities. Maintained trails make it easy to ski over to the base of Peak 9, although this connection looks completely different – like a short forest hike over the Blue River – in the summer. Near the base of the ski runs is the trailhead for the Burro Trail, which extends several miles to the south and intersects other trails in the national forest, used by mountain bikers, hikers, and cross-country skiers. The Inner Circle Condos have a mansard, shake shingle roof, which makes them seem quaint in this neighborhood of condos, many of which were built in a minimalist style of cast concrete and wood accents. Although there is a lot of lodging in this small area, trees and the forest quality has been preserved around them. Inside this woodsy loop are nestled the Inner Circle Condos. Most condos for sale in Inner Circle will have an open floor plan with ceiling to floor windows and a sliding door to a small balcony. For space efficiency the kitchen is a galley style and spiral stairs lead to the upstairs loft. The Inner Circle Condos share a common entrance and the grounds are maintained in common. Many overlook the Columbine Pool and have views to the Ten Mile Range. No garages or underground parking were built with the Inner Circle Condos, but there is off-street parking. Located in Warriors Mark, directly next to the Columbine Pool, in the center of the Columbine Loop. Drive south on Main Street to last stoplight at Boreas Pass Road, turn right on Broken Lance Drive. At the three-way stop make a right onto Columbine and turn left on Snowberry. Inner Circle will be at the end of this road on the left. 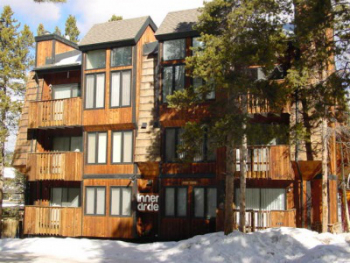 Would you like more information on Inner Circle Condominiums and Breckenridge real estate? We can fill you in! Contact us online or call us at (970) 453-2200.